The white fences and green pastures of the southern Blue Ridge roll past as Lauren Bergrud navigates her way across the familiar terrain. She’s in her element here, whether on two wheels or four hoofs. Her vintage black Yamaha hums along next to the tranquil fields where contented horses flick their tails as she motors past. 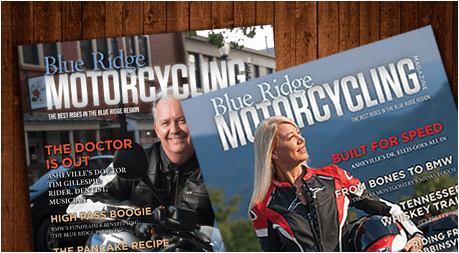 The Columbus, North Carolina, resident’s interest in two wheels developed almost as early, fueled by her father’s love of motorcycles and the perfect combination of a dirt bikes and farmland. Her days are often spent dividing time between her two passions for riding. For most of her life, the two-wheeled steeds were strictly off-road machines, but three years ago she took the Basic Rider Course and finally got her motorcycle endorsement to ride on the street. Today, her stable includes a 2005 Kawasaki Ninja 636, a 1982 Yamaha Maxim 750 and a vintage Triumph. Her brown eyes spark to life as she describes this magical connection, especially when she talks about Beloved Beetle, one of the horses on which she won several equestrian events last year. Bergrud competes in several categories, including hunter-jumper and all-around eventing. Bergrud jokes she’s been on horses since she was in the womb, inheriting her love of the animals from her mother, Toni. “My mom started riding when she was 13. Since she always had horses, it’s just been in the family.” She attributes her other riding interest to her father, Nic. Tinkering around the farm helped prepare Bergrud for becoming the diverse artist she is today. She studied at Moore College of Art & Design in Philadelphia, among other schools, and creates unique and stylish creations in such varied mediums as woodblock printing, drawing, woodworking, sculpture as well as functional furniture. She pulls back her dark, wavy hair while trying to describe her work — while hesitating to apply a label or confine herself to one artform— and reveals a tattoo on her inner right arm. It’s a line drawing of compass arrows with north pointing to her elbow. Her journey often takes her across the scenic roads nestled against the Blue Ridge Escarpment along the border of the Carolinas. 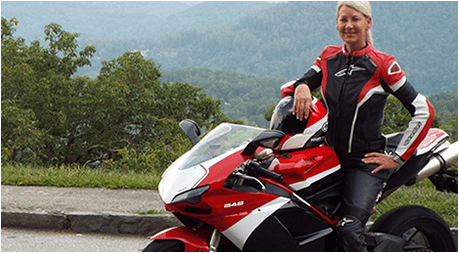 Her friend and fellow motorcyclist Roberta Heinrich sometimes joins her as they rumble through the rolling hills. Heinrich also shares the love for horses and bikes. She took up motorcycling 16 years ago and went on to explore parts of Canada and the western states by motorcycle. “I started riding in spring of ’02, and it was the most empowering and exciting thing I have ever done. 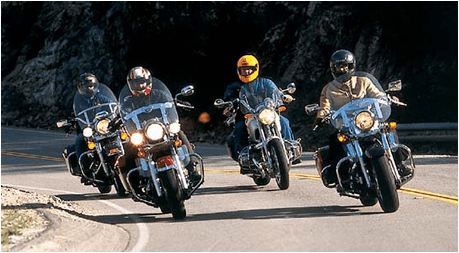 I started with a Honda Shadow and in less than a year, I sold my horse after being a lifelong equestrian and bought the ’03 Harley Davidson Low Rider I still have and ride today,” Heinrich says. 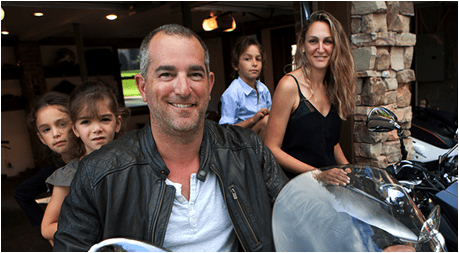 Coming from the world of horse competitions, the closeness of the motorcycling community at a track days and amateur races really impressed her. When she decided to do her first track day, she contacted another female racer whom she follows on Instagram and was surprised by the outpouring of information and encouragement.